A growing trend over the last few years has been the idea of buying premium dog food. The idea is that buying a type of dog food that is perhaps more expensive than one you would just pick up at a supermarket comes with a wide variety of benefits– benefits which will ultimately not only save money, but also be better for your dog. But what exactly is premium dog food, and is it worth any extra cost? Most veterinarians say yes. Here’s a closer look. To start with, what is premium dog food, and what is the difference between it and standard food? It comes down to the ingredients. Whilst most pet foods do at least meet the minimal requirements and standards for nutrition, most of the cheaper foods accomplish this by way of fillers, additives, and by-products that do not do much to help your dog. This means that your dog will be eating more of these “empty calories” just to get the nutrients that it needs, so in the long run, even though the food is cheaper by the kilogram, you will ultimately have to buy more of it. In addition, many of these base ingredients are known to cause allergies and other health problems in dogs, which can lead to higher veterinary bills. Healthier Weight: Because a dog needs to eat less of a premium dog food to feel the benefits, that dog will probably weigh less than one who has to eat more to get their necessary nutrition. More Energy: Premium dog foods tend to be closer in composition to what dogs evolved to eat in the wild. Wild dogs need a high energy diet in order to fuel all their physical activity. You’ll likely notice that your dog is more energetic and playful once he is on a diet that is closer to what nature intended. Easier digestion and fewer allergies: Related to the above point, a dog that is eating the way nature intended him to eat is much less likely to have problems digesting his food because it is natural for him to eat. Similarly, the fewer additives that are in the food, the less likely it is for your dog to have a bad reaction to an ingredient. Immune System Support: It is better for any animal to receive the bulk of their nutrients from actual nutritious food rather than from supplements or other additives. When your dog is absorbing all the vitamins and minerals he needs, he will be healthier and better able to fight off infection. Longevity: Just as in humans, a better diet leads to a longer life. A better diet also leads to a healthier animal, which contributes to longevity. Thanks to these and other benefits, it’s no surprise that more veterinarians and experts are recommending premium food as the dry dog food of their choice. Perhaps it’s time for you to give it a go and see the difference a better food makes for your dog. 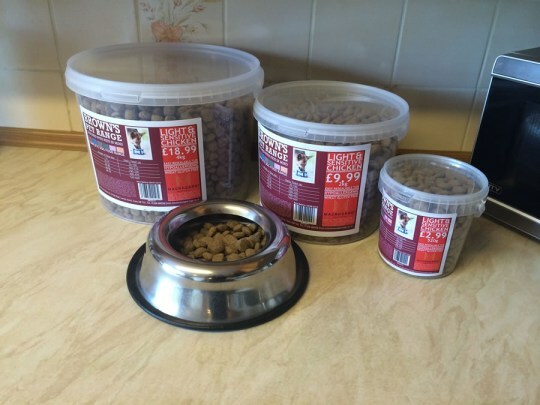 Brown’s Pet Range is a UK based company dedicated to helping you care for your pet with premium quality products. If you’re ready to give our dog food a try, we would love to send you a free sample. We know that your dog will love it and that you will see a difference.